AT scale out: The TFS Admin could have initially setup a single AT with a local ES instance in the same machine and now wants to scale out TFS by adding new load balancer ATs. ES scale up: ES would have been setup in a separate remote machine and the TFS Admin now wants to provision a larger machine for ES for better performance. Note: If you are configuring Search in a multi AT scenario it is strongly recommended to setup ES in a separate remote machine. Currently, data migration is not seamlessly supported while moving data. (A few manual hacks are required to ensure the the configurations are in place post the migration). Meanwhile, the general recommended procedure is to re-index the collections. The following content explains the step-by-step approach to ensure this migration happens as per expectation. Scenario 1: Single AT + Local ES setup. ES is initially setup locally in the AT machine. Now, ES needs to be setup in a remote machine. 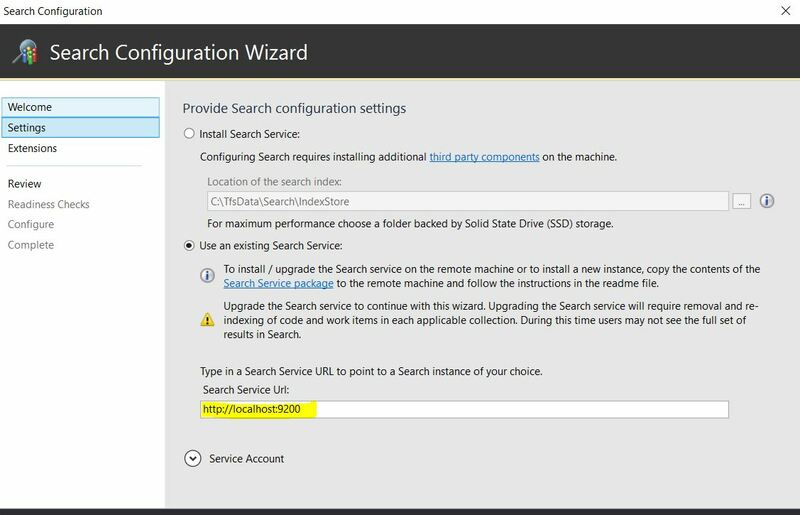 Unconfigure Search from the AT instance. Setup ES in a new remote machine using the Configure-TFSSearch.ps1 script from package as described here. Configure Search. 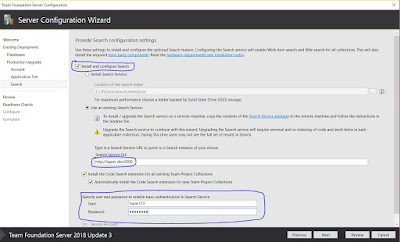 Update the Search URL in the configuration wizard page to point to the new URL. Complete the Search configuration. This will auto-trigger a re-indexing of all the collections where Search extension (Code, WorkItem) is installed. Refer the blog post here to monitor the progress of the indexing. 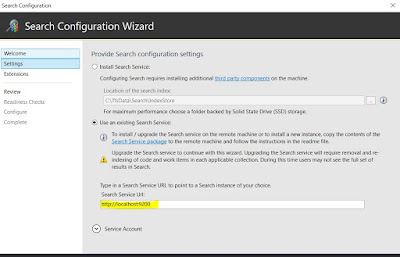 Unconfigure Search in the primary AT where it was initially configured. Configure Search in the primary AT instance. Update the Search URL in the Admin page to point to the new URL. No additional Search configuration changes are required in any of the load balancer ATs. Both of the above scenarios have essentially the same steps. For clarity I have separated them out and used terms to distinguish primary and load balancer instances. To verify that the URLs have been updated correctly in both Configuration DB and all the Collection DBs, check for these entries. The output values should be pointing to new ES URL. If the URL in configuration DB is still stale (i.e. pointing to old ES URL), you could reattempt reconfiguration following the same sequence of steps mentioned above for the 2 migration scenarios. If the URL is incorrect for all EntityType's properties in the collectionDB, it is suggested to follow the "Clean-up Index Data and Re-index" steps. - To monitor the indexing progress, check the blog post here. Post these troubleshooting measures, if you are still unable to view the Search results post re-indexing, do contact the CSS for assistance.